We break down the top 5 Ford Mustang performance modifications that give you the best power increases and can be installed by anyone. Installing the 5 best bolt-on power mods will provide a distinct advantage over other Mustangs without the cost and difficult install of a traditional power adder. 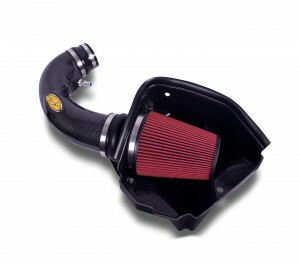 Even the most novice Mustang owner will have the ability to replace their stock airbox with a cold air intake (CAI). Your stock air intake does a decent job of flowing air, but for the performance minded Mustang owner, replacing this unit is an easy and inexpensive place to pick up extra power and increased efficiency. Requiring little more than a screwdriver, socket set and about an hour’s worth of time, a cold air can bring you around +15HP and an increase of 1-2 MPG, depending of course on your driving style. There is also the added benefit in never having to replace your air filter again as the high-flow filters that come with an after market CAI simply require a periodic cleaning. Some of the new cold air intakes require a tune to work properly. If you are shopping for one, be certain you also purchase a tuner so your motor can compensate for the added airflow. Without a tune, your Mustang may not run properly due to a poor air/fuel ratio, putting the engine at risk of causing permanent damage. 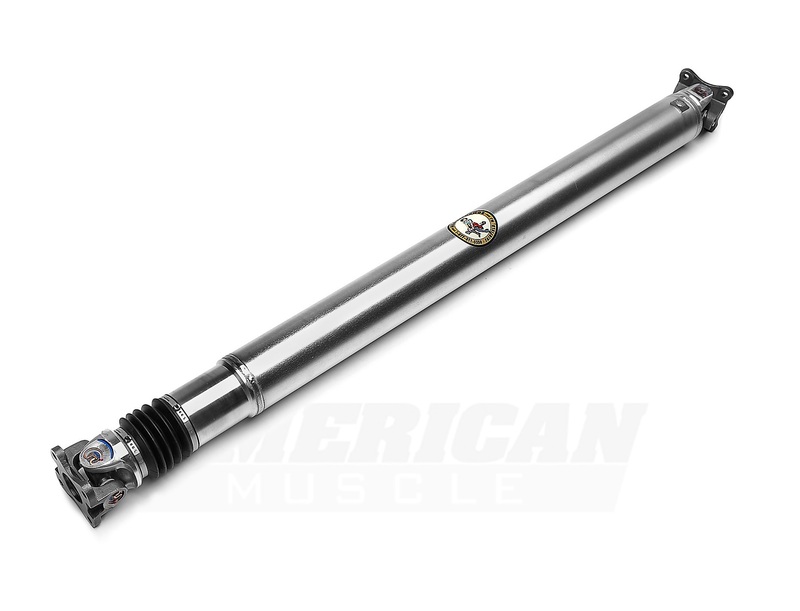 Replacing a Mustang’s OEM steel driveshaft with an aluminum driveshaft benefits you in 4 ways: 1) you reduce power loss throughout the drivetrain by 2-4% 2) a weight reduction by ~20 lbs 3) quicker acceleration and throttle response and 4) Aluminum driveshafts reduce noise and vibration heard and felt inside the car’s cabin. Though this mod doesn’t necessarily add horsepower, it makes the list as a top performance mod through restoring the power you typically lose through inefficient drivetrain components, known as parasitic drag. Installation isn’t difficult though it does help to have a lift and a second set of hands . Expect to spend a couple hours on installation. A cat-back replaces the stock exhaust from behind the catalytic converters all the way back to the exhaust tips. 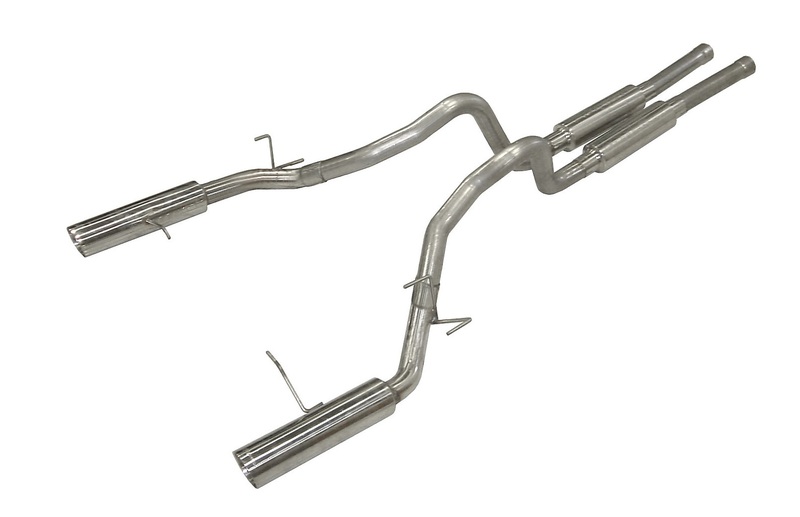 Aftermarket cat-backs shed about half the weight of the stock exhaust, flow better and will transform the sound of your Mustang. Choosing a cat-back that replaces the mufflers with straight-through piping will create a higher pitched, more untamed sound whereas different mufflers let you choose a refined exhaust note. The amount of horsepower you’ll receive varies greatly between the different generations of Mustangs, with the older cars seeing bigger gains than the newer S197s out of the box. However, an aftermarket cat-back allows other related mods to perform at their peak and even the 5.0 Coyote Mustangs have seen as much as 50+rwhp when installing headers and high-flow cats. Do I need a tune when installing a cat-back on my Mustang? While the answer is technically no, to receive the maximum performance gains and efficiency it is suggested you tune your Mustang. 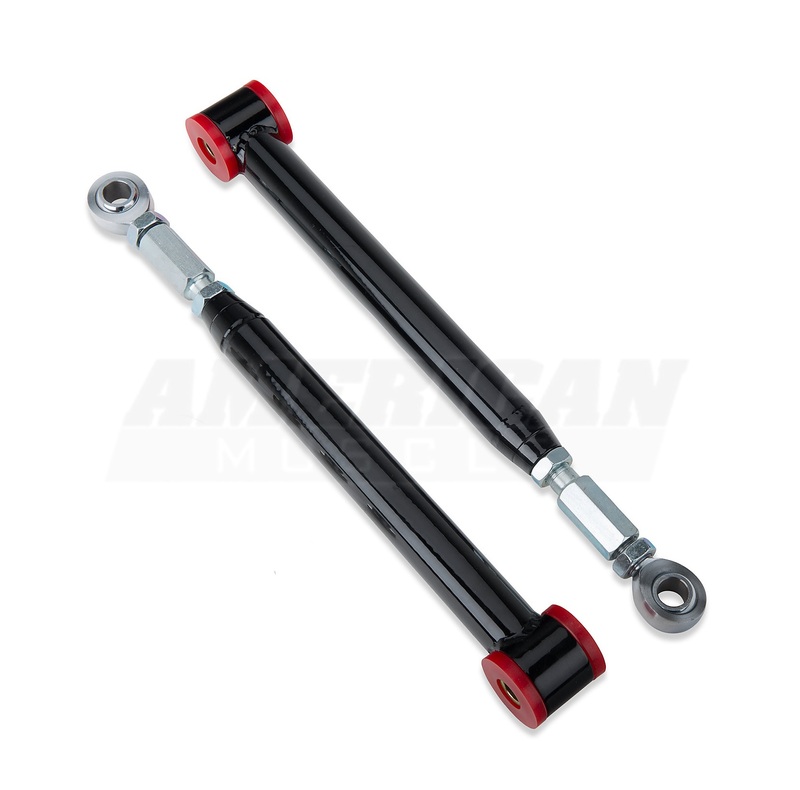 You can wait to tune the car until you replace other exhaust components, or for free tunes for life members, just let AmericanMuscle know your current setup and have a fresh custom tune mailed out. Some may question how a wheel and tire setup will increase performance, but those who have driven their Mustang at the track or through a road course know the important role they play in displaying a car’s performance capabilities. Tires are the key component to getting the power you’re making to the ground. No grip, slippage issues and all around poor performance can be attributed to not having the right tires. 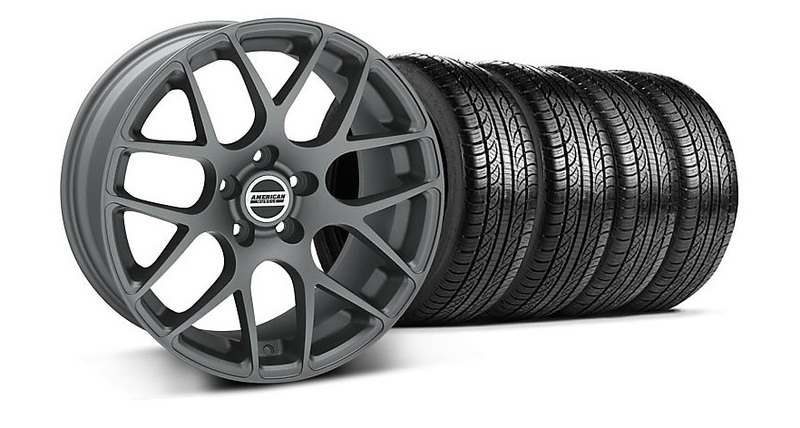 Selecting a set for the type of driving you do and increasing the width of your rims to allow a bigger tire size will increase traction reduce the time you waste spinning tires and not going anywhere. If it’s drag strip, ¼ mile times you’re after, picking up a good set of slicks will go a long way and will produce more consistent times. A set of drag weld rims with skinnies up front also frees up weight and can translate into a few tenths of a second off a ¼ mile pass time. Running wider rims allows for bigger tires and more surface area in contact with the pavement. For the heavily modded guys (or even you stock 5.0 Coyote owners out there) running wider tires can be essential for a safe amount of grip on the street or a track course. Along the same lines of wheels and tires, replacing the stock lower control arms with a traction-inspired aftermarket set will gain you more grip, faster 60ft times and reduce wheel hop during hard launches. The bang-for-your-buck factor is high and LCAs are a great first suspension mod for anyone new to the aftermarket world. Installation is simple and requires little more then basic tools and a couple hours of your time, but the benefits will last. This is one of those bolt-on mods you can throw on at any time and not worry of having any future issues or problems while building towards having better all-around performance. Next Entry News: Ford Insider Leaks 2015 Mustang Motor Lineup – the Mustang Goes EcoBoost!